Kiowa Creek Community Church (KCCC) is located at 231 Cheyenne St., Kiowa, Colorado, about 30 miles southeast of Denver. Take Colorado State Highway 86 to the Town of Kiowa. Continue on Highway 86 (which becomes Comanche St.) to Pawnee St., located beside Hoo Motors. 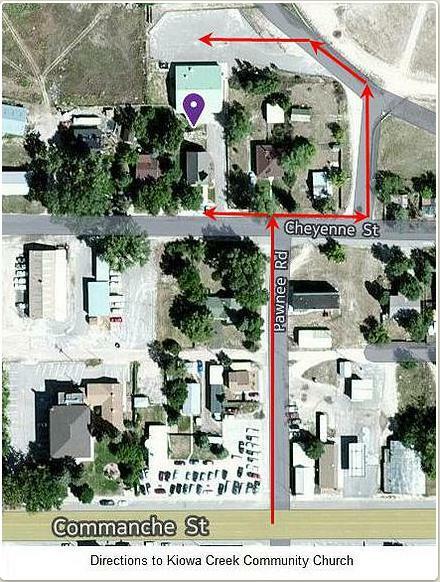 (You will see a small blue sign for Kiowa Creek Community Church at the corner of Pawnee St. and Highway 86.) Turn north onto Pawnee St., and go to the end of the road to a “T” intersection.